Covers are a tricky beast. When, say, Jose Gonzalez covers the Knife, I'm fine with it. But the moment someone pulls an acoustic guitar to Radiohead, I feel a pain in my chest. Covers are a tricky beast. When, say, Jose Gonzalez covers the Knife, I'm fine with it -- he brings an entirely different emotion to the song, so that now, for many people, his soft-picked version has become the definitive interpretation. But the moment someone pulls an acoustic guitar to Radiohead, I feel a pain in my chest. I can't help it -- I'm that personally invested in the originals, because they coincided with my discovery of the possibilities of popular music. So when John Mayer strums along to "Kid A", draining it of all subtlety and emotion, it's regrettable to say the least. ...and the opening cuts give us a lot to worry about. Shawn Lee's version of "No Surprises" is, in short, abysmal. It's Radiohead's simple chord oscillation turned out all sleazy-lounge, with peppy trumpets -- peppy trumpets! And when Lee over-enunciates the word "government" as if to say, "This is America, this applies to us in America now", or when the instruments drop out for him to wail "Such a pretty house / Such a pretty garden", it's pretty much unlistenable. The Mark Ronson and Alex Greenwald (from Phantom Planet) cover of "Just", beaten to death recently on UK radio, is little better. Indie rock given the horn-jazz treatment is a risky proposition always, but the real problem is Greenwald's vocals. He sounds a more confident Thom Yorke, aping the inflexions and vocal aches too closely. The result is imitation without much innovation, and it's just... bland. To continue with the disappointments, and there's no need, really, to be so painstaking (these songs don't deserve it), the Randy Watson Experience give us "Morning Bell" as electronic jazz, but they've kept the wrong electronic elements in: it sounds like some amateurs taking a computer to Radiohead. And don't get me started on Pete Kuzma's "High and Dry"; already ruined by Jamie Cullum, there's no need to give it the easy listening makeover again. That's just cruel. A few more of the songs fit into the 'interesting idea'/'not quite pulled off' category. RjD2's version of "Airbag" starts off promisingly; the theme of the song is turned into a distorted harmonica melody while a subtle hip-hop swish labors underneath. The needling synth version of the original's aggressive guitar line, though, doesn't quite work as well, and by the three-minute mark, we know where this is going. "Everything in Its Right Place", as performed by Osunlade, is dark, dystopian electronica with Brazilian rhythms and a heavy cello bass line; but the vocal's too smooth, understandable, which is not the way these songs were intended. And Cinematic Orchestra's version of "Exit Music" is expansive if not particularly evocative of the original's intense feeling of desolation. 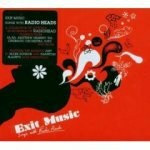 But Exit Music: Songs for Radio Heads is almost redeemed by a few cuts that succeed on all levels. The Bad Plus's version of "Karma Police" is a masterful, expansive free-jazz meditation, the tune at first all twisted and broken up so you're not quite sure where you are. Think shimmering cymbals, looping piano improvisations. Five minutes in, the chorus breaks out in piano octaves and complex, aggressive drums, and it's thrilling. At the end, things go off the rails in a purposeful out-of-tune series of cacophonous chords. Sa-Ra get it right, too. They give us Radiohead turned house in their cover of "In Limbo"; it's reminiscent of the heaviness of new Knife mixed with some of Moloko's sass and the "world" interjection of "Push the Button". To prepare for listening to this disc, I cued up the original Radiohead songs in the order they appear on Exit Music: "No Surprises", "Morning Bell", "In Limbo", "High & Dry", "Just", "Airbag", "(Nice Dream)", "Blow Out", "The National Anthem", "Karma Police", "Everything In Its Right Place", "Knives Out", "Exit Music (For A Film)". My advice -- if you haven't returned to them in a while, take a listen. The originals are still full of the aching beauty that made you first fall in love; how can anyone record these songs and really hope to compare?